What is the Children's Service for the Visually Impaired? 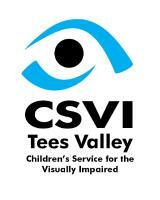 The Children's Service for the Visually Impaired (CSVI) is a service funded by the council to provide support for children and young people who have been diagnosed with a visual impairment. CSVI aims to ensure that all children reach their academic potential, and are active members of society. CSVI staff help children, their parents, and adults who work with the child to understand the visual impairment, and how it may affect the child’s day to day life, both at home and at school. They are teachers with specialist training in supporting children who are blind or visually impaired. The service has an open referral system. After working with a child and assessing their vision, we'll use nationally-agreed criteria to decide on a suitable level of support. If you think your child or you are a teacher working with a child who seems to have difficulties with accessing text or has nystagmus (wobbly eyes) please contact us to see if we can help. The level of support can vary from weekly visits to the home to help develop vision in young babies, through to termly visits into school to ensure that teachers are aware of any adaptations that are needed to help with access. There are also specialist bases available at primary and secondary age for those children who may need a tactile curriculum. What support and groups are available? CSVI runs a regular parent and toddler group to give support and advice to parents, as well as a social group for 8 -13 year olds to help develop social skills and awareness of their peers across the Teesside area. Children are frequently taken on residential activities to help develop their independence and life experiences. Support to help develop independent living skills is provided by a habilitation officer, who will visit homes and schools to make sure they are suitable and safe, and also work with individuals to help them overcome any difficulties. An IT advisor and specialist support officer will work with children and schools to help them develop access to technology. All VI Teams work with babies, children and young people aged 0 – 25. It is important that after clinical diagnosis an early referral is made, as this will enable the V.I. service to support parents, observe visual behaviour, and offer practical advice and signpost to other agencies and support groups. After a visual function assessment within the home, early years or educational setting appropriate levels of involvement will be determined by using the NatSIP Eligibility Criteria, (national standardised criteria for scoring support levels). Visual acuities of 6/18 or worse, after optical correction. Near vision recorded as N12 or worse, after optical correction. Visual field problems such as hemianopia, tunnel vision, monocular vision and children with a prosthesis. Severe difficulty with colour discrimination/confusion, e.g. red/green colour blindness.